Did you know that approximately 3 billion genetic letters come together to form a human genome? Scientists believe that the haphazard sequence of these coded strains may bring more insights, diagnostics and therapeutic angles for many diseases. But the key to unlocking these secrets lies in combining AI technology with genome sequencing. What problems can advancements in genome sequencing help us solve? We’ve discussed the questions of “nature vs nurture”, personalized medicine and the privacy of genomics data with Dr. Wim Van Criekinge, Chief Life Science Officer at doc.ai. 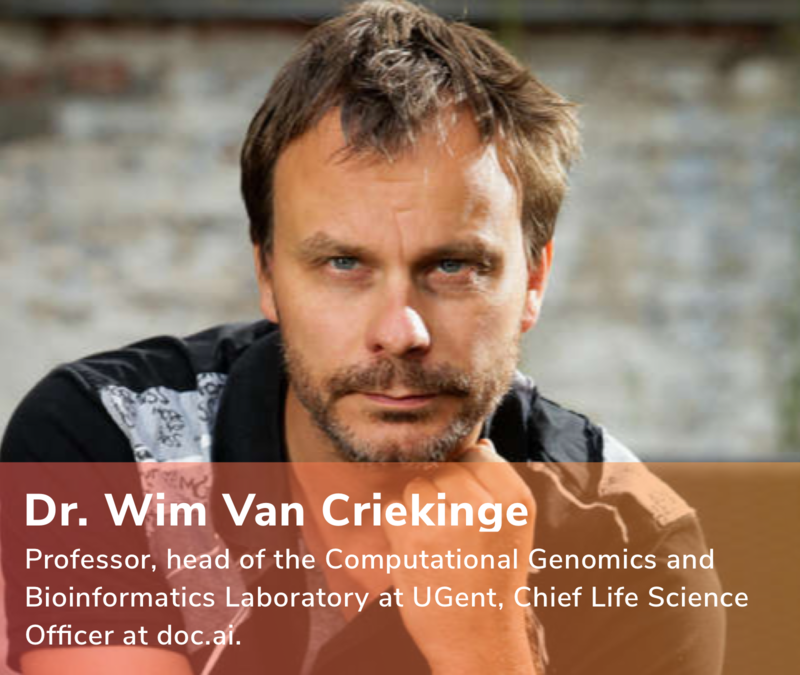 Wim serves as a professor at UGent where he heads the Laboratory for Computational Genomics and Bioinformatics (Biobix). In 1997, he was co-founder and director of Devgen, a biotechnology company which had a successful IPO in June 2005. He specializes in the fields of epigenetics, biotech, translational medicine, bioinformatics, ICT, pharmacogenomics, eHealth, biobanking, omics, and biomarker research. For those who are new to the topic, what is the human genome? Well, in its entirety, a human genome is the complete set of our DNA structure that resides in the nucleus. Think of it as the blueprint of who we are, our cellular makeup. It determines how we look and how our bodies function. The problem is that this intricate code can’t be easily translated into a man-made language once the sequence is arranged/assembled. So one must place the various DNA nucleotides (bases) – the As, Cs, Gs, and Ts – in a specific order to start interpreting what it means. Over the years, the merger between IT (bioinformatics) and biomedical technology has accelerated the process of genome sequencing, and over time by applying AI technology to large amount of datasets we will see more impressive results. And the time is here: health data is estimated to double every 73 days by 2020. The advancements in AI along with an increase of computational power will lead us to even more discoveries and progress in genome sequencing. What is also worth mentioning is that genome sequencing has always been to some extent an exclusive (and elusive) field of science. But I think the field should be demystified and accessible to anyone, and as technology progresses it will be more accessible than ever before. The discussion around nature vs. nurture has been around for many years. From your perspective, what has a greater impact on human health: genetics or environmental conditions? In my opinion, genetics play a vital role in our lives, but they aren’t prominent contributors to every disease. Those variables are also defined by our environment and can be modified by changing our surroundings and lifestyle. Our genes help us track our ancestry and potential risks for diseases. But our genetic composition isn’t just relevant to our physical features, familial history, or disease risk. It also controls our bodily functions, like our metabolism, for instance. That’s why some people are naturally thin and petite no matter how much they eat, while others require a strict diet to maintain their physique. Moreover, each body genome has different nutritional requirements. That is why iron deficiency diseases like anemia are prevalent in some family members. Yet, it isn’t found in others. Additionally, our genes partly determine how athletic we are and how well we recover after exhaustive physical work. However, environmental influences should also be taken into consideration. For example, air pollution, nutrition and our lifestyles play a major role in our health. Genomics can’t be evaluated and approached without the context of environmental and lifestyle factors. Full omics data, like the exposome, environmental conditions and air quality; physiome – physical activity; and pharmaconome meaning medications and supplements intake, all count. To better understand real health conditions and how to improve them, it’s necessary to collect data from different sources, activities, connect the dots, and provide a more mindful and holistic perspective on overall health. In that sense, doc.ai, with its multi-omics data collection platform, provides precisely that approach that I advocate for and believe in. Some studies say that cognitive diseases are influenced by genetics. How would you address that? You see, most human diseases have a genetic component (inherited), but that does not mean we have found all the causal variants. For example, genetic deafness is an inherited disease. While we have clarity on key contributing genes, we are relatively ignorant on other causes of the condition. An easy way to intuitively grasp the heritability of a disease is to look at the concordance for certain phenotypes/traits in monozygotic/identical twins. It has been shown that in many cognitive diseases, genetics play a significant role. Autism, schizophrenia, and Asperger’s syndrome all have major hereditary components. These diseases have a genetic basis and are often caused due to mutations in the genetic blueprint. For instance, the APOE4 gene variant is strongly linked to Alzheimer's disease. However, treatment of some of these conditions is linked with environmental changes. For example, you can train a child with Asperger’s syndrome by making them accustomed to different patterns. The set routines help them feel less agitated and more responsive to their surroundings. In other words, “nurture” can modulate the manifestations of the body’s genetic diseases. I believe one cannot be isolated from the other. They are interconnected in terms of etiology, recovery and treatment. How can people benefit from advancements in genomic sequencing? Can you give some examples? I think this can be explained through the simple example of medication. Some medications work for one person but may be completely useless for another. The reason for this is that some drugs just don’t get activated or metabolized in the same way with each individual. You see, prescribing everyone with the same bottle of pills isn’t the right approach. It generalizes the disease and the way the drug gets activated and metabolized in the body. Take breast cancer, for instance. There are many subtypes of breast cancer, and for every type a specific therapeutic plan should be considered. Basically, the situation we have today is that a lot of drug inserts contain already valuable clinical/pharmacogenomic information on how they interact with different genomic variants – if one looks at those instructions and maps that into their genomic interpretation, they will have more understanding of how that drug will either work for them or cause undesirable side effects. But nobody does that! We already have available data – we just need to connect the dots, and doc.ai is taking steps towards that goal. In the future, medicine will be catered to the individual. I’m an advocate of preventive medicine. We should do our best to prevent disease and pay doctors to keep us healthy rather than fighting with symptoms and consequences of generalized medicine. What is the main problem in the healthcare field with regard to genomics that is not addressed? I think it’s a lack of sufficient education related to technology and genomics. A general physician’s understanding of the role genetics play on health is still inadequate. That’s why I am excited about the series of courses for doctors that doc.ai will host on its Crestle.ai platform. We need more such educational courses, and I am preparing one to help to fill in the educational gap. One of the main concerns around genomics data is privacy and security. What’s your approach to that? Genomics data should be treated with a high priority of privacy and all actions should be conducted with a person’s full consent and clear understanding of how exactly their data will be used. With this in mind, my values fully align with doc.ai to ensure a high industry standard of ownership, privacy and security of data on the platform.